Fixing Grace : The King of Shaves Razor Review. Over the past 28 years of needing a razor, I've become quite a connoisseur of these plastic, metal and even wooden handles with one, two, three, four and even five blades of cold steel. I've also owned no less than three electric razors, which have lasted me less than a month or two before needing major work. My beard is extremely tough and skin sensitive, so cheap razors are usually out of the question. Since blogging has failed to pay off thus far and my hours have been cut as of late, I can't in good conscience spend $15 for four blades either. I went to Meijers and found the King of Shaves by Remington (a name more associated with typewriters (remember those) as well as electric razors, guns and ammunition. 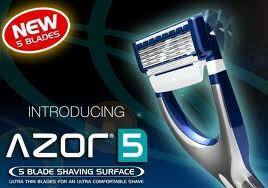 It helped that the package includes a razor and 3 blades as opposed to the competitor's one or two. The $6.36 price with tax included also sweetened the deal, as did the fact that six blades in a package for less than $10 in a replacement box. I took this deal home with a can of shaving gel (I'm not reviewing this yet) and brought it to bear on my 5oclock shadow. One thing I noticed was that regardless of how hard I pushed, the handle brought consistent pressure on my face. This because of their "S-Flex"; the trick is to let the razor do the work. The shave itself was close, with minimal stubble and fewer than normal passes on same. It didn't cut, nor irritate as it shaved, and this can be credited to the alignment paddle at the bottom of the blades. However, the lack of a trimmer blade on the back might make those sideburns a challenge. For the life of me, I can't imagine save for cost cutting why they didn't include it. On the upside, the electric trimmer I have made short work of that. Even more expensive razors with three or four blades don't always include this either, so it shouldn't be a deal breaker. As for the longevity of these blades, the jury is still out as far as I'm concerned. If they hold up to my beard, they can hold up to anything. The coating they use is called Endurum, which is supposedly nano coated and "optimized for senstive skin." The Mach 3 and Fusion, both by Gillette, perform really well but seemed to wear out in a hurry to this writer. They usually lasted me less than two weeks per blade. These are also the $12 to $15 per 4 blades. Even if the Remington lasts that long it will have paid for itself. It seems that even with a very minor fault, Remington seems to have a winner here. I'll keep you posted on how these blades hold up. Great review! Every time I read of a new person trying the KoS Azor I get excited because I know what it did for my shaving experience. It's unique and brilliant. I would also encourage you to find other KoS shaving oils and lotions because they will have as much impact if not greater impact on your shaving experience than even the Azor will. Enjoy!